Exploring issues surrounding book cover design, editing, indie and self-publishing. As self-publishing becomes more mainstream, the bar for quality and professionalism is on the rise. As we settle into 2014, the indie publishing blogosphere is full of retrospectives and predictions for the new year. 2013 gave us plenty to celebrate, and trends in self-publishing suggest there could be a lot to look forward to. Of course, the sheer number of self-published titles reflects just how popular the practice is. With such a crowded field, standing out can seem impossible, but some authors are doing just that. Ninety-nine self-published titles appeared on Digital Book World’s bestseller lists in 2013. That’s more bestselling e-books than either HarperCollins or Simon & Schuster had last year. As indie authors gain traction, traditional publishers are taking notice. More self-published authors are signing book deals, and some authors are even turning them down. Brenna Aubrey passed on a three-book New York deal in favor of self-publishing, resulting in an impressive first month of sales. The trend of publishing independently is becoming too big to ignore, as evidenced by the Wall Street Journal article on indie author Russell Blake, who has signed a deal to co-write with Clive Cussler. Granted, for every success story there are droves of authors writing in relative obscurity. And, as numerous industry experts, including Mark Coker of Smashwords, have pointed out, the competition will only get fiercer in 2014. As self-publishing becomes more mainstream, the bar for quality and professionalism is on the rise. So what’s an aspiring indie author to do? Above all, make sure you have the best book possible before sending it out in the world. Use beta readers. Find an editor whose style works for you. Find the designer who can make the best cover for your book. And then get back to writing. The back cover layout for The Bean Trees. It goes without saying that the cover of your book is key. Some informative blog posts have addressed techniques for creating an effective front cover, but an often overlooked aspect of book cover design is the back of the book. You might ask, does the back of the book even matter? When buying an indie print book, readers are usually shopping online, where they’re most likely judging the book by its front cover. 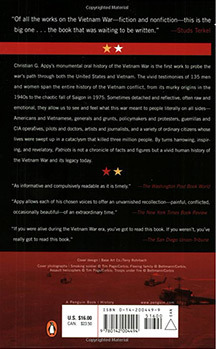 The back cover layout for Patriots: The Vietnam War Remembered from All Sides. However, most books on Amazon have the “look inside” feature, allowing the potential reader to view the back of the book before ordering. Not to mention, once your book arrives, the back layout can color readers’ expectations as much as the front cover. And what about books you order yourself to sell at events? Your book is your product, reflective of your author brand; you want it to look as professional as possible. The back cover layout for The Good Girls Revolt. We’ve all seen off-putting back cover layouts—those books you flip over and can immediately tell are self-published. A sprawling, hard-to-read blurb screams amateur and can make readers second-guess their decision to pick up the book. 1) The back cover should have some sort of design that mirrors the tone of the front cover without distracting from the content. While you’re not aiming for the dominant, eye-catching quality of the front cover, you also don’t want a clunky layout that looks like it took two minutes to throw together in MS Paint. Smaller images, textures, frames, and flourishes can add a sense of design to the back without overwhelming the text. Depending on the layout, sometimes the design from the front can wrap around to the back, creating a unifying effect. Sometimes the back cover offers a chance to adapt concepts that looked good but didn’t quite work for the front cover. Making the type too large (looks clumsy) or too small (hard to read). Generally, it’s best to keep your type between 8 and 12 points. Resist the urge to increase the size of your type until it fills the page. Without some room to breathe, your blurb looks like a chore to read. Setting the copy in all caps (hurts readability and makes the reader feel like they are being SHOUTED AT). You can use all caps effectively if they are limited to the opening sentence or first few words of your blurb. Enlarging the first letter of the first word (drop cap) can also give your copy some punch. Using a hard-to-read font. Though it might be tempting to use a gimmicky typeface, it’s best to stick with the classics for back cover copy unless you really know your stuff. Your font choice should reflect the tone of your book without drawing too much attention to itself. Remember that the most important factor is legibility, which requires contrast between the type and background. White type on a dark background can be effective and attention-grabbing, but it can make smaller type (especially serif fonts) indecipherable. 3) You don’t want your back cover to be crowded, but it should have some substance. Look at the backs of traditionally published books (which have trained readers to expect certain content). Include an author bio to let readers know more about you. Consider an author photo (and don’t forget to include the photo credit). Adding your website can help readers find you online. 4) If you’re fortunate enough to have review quotes, include those on the back cover (unless you’re using them on the front). The stronger the quote, the more it should stand out. 5) Then there are the nuts and bolts of a back cover: barcode, category, cover design credit. Readers might not notice these, but their presence gives the subconscious message that your book is professional. 6) If you’re self-publishing under your own press, include the name (and website?) of your imprint. If you can hire someone to design a logo for your press so you can include that on the back, even better. 7) The spine is also important. Don’t just slap on the title and author name. Design the spine in a way that complements the rest of the cover and can catch readers’ eyes from a distance. Indie authors often don’t have all the back cover content that a traditionally published book has, but that doesn’t mean your back cover has to be empty. Be creative. I’ve seen self-published authors include thumbnails of their other books or QR codes for their websites. The key is to remember that readers expect a professionally designed back cover (and spine) as well as the front. Spend some time on it. 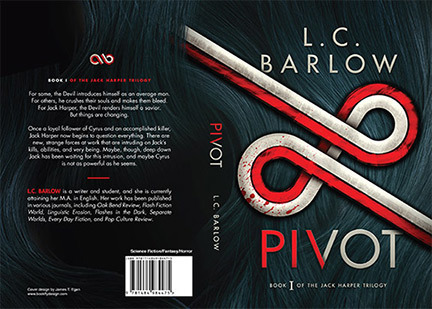 Here's one of Bookfly's recent full cover designs (Pivot, by L.C. Barlow). Contact Bookfly Design to learn more about our services for indie authors looking to self publish, to schedule a custom book cover design, or to arrange for copyediting services for your manuscript. 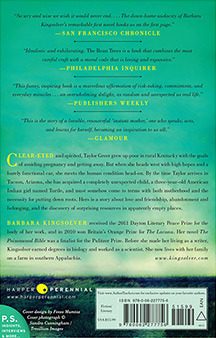 Examples of some of the book cover designs created by Bookfly's designer. © 2013-2018 by Bookfly Design LLC. All rights reserved. Bookfly Design offers self-publishing services for indie authors, including custom e-book cover design, book cover design, and copyediting.